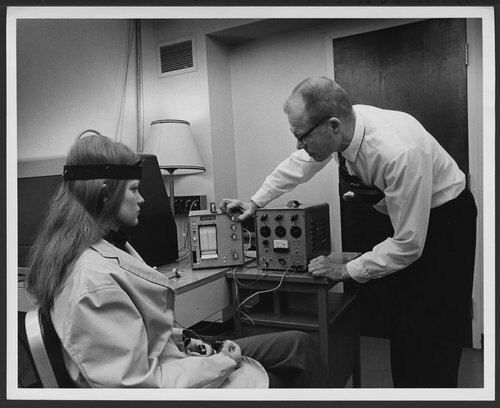 These black and white photographs show the pioneering biofeedback research project. The Menninger Foundation is a non-profit organization devoted to treatment, training and research in mental illness. Dr. Elmer Green was the pioneer in biofeedback treatments. Biofeedback research and treatment at the Menninger Clinic, Topeka, Kansas - Elmer Green, Ph.D., wires a subject for theta brainwave training. Posing as subject is Judy Green.